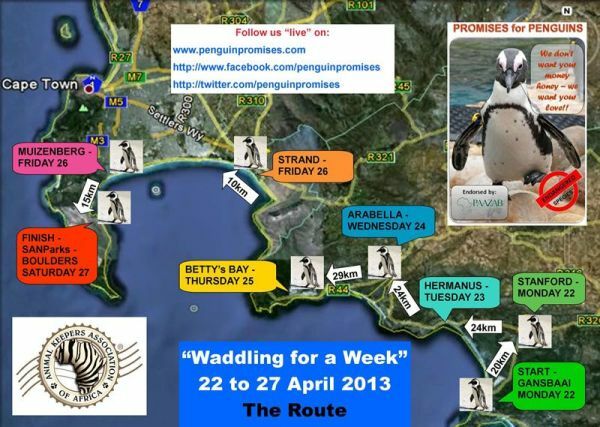 Today the AKAA are starting their annual Waddle for a Week to raise awareness for the endangered African Penguins. Cape Point Route wishes them a successful walk and encourages everyone who loves penguins to pledge a promise and show your support! Penguin Promises is a campaign which was ‘hatched’ in 2011. The AKAA (Animal Keepers Association of Africa) decided to choose an endangered species and create an awareness drive in support of it. The African penguin was chosen as their numbers are currently as low as 60,000 birds in the wild compared to a very healthy population about 100 years ago of approximately 1.5 million. Scientists claim that this species could go extinct within the next 15-25 years should environmental conditions not improve for them. This bird is endemic to southern Africa and considered an iconic animal as well as an indicator species, indicating to us the state of our oceans. 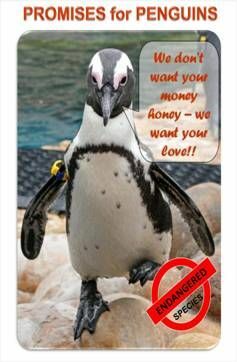 Most important to recognise is that the Penguin Promises campaign will always focus on awareness, versus fundraising, therefore our slogan “We don’t want you money honey we want your love” pretty much says it all. It is generally felt that when the public donate money to a cause they very often feel momentarily better about themselves and then walk away perhaps not really knowing or caring what happens thereafter. Penguin Promises explicitly proposes that each and every person who currently has the privilege of living on our beautiful planet looks closely at the way in which they are in relationship with nature, and makes a conscious choice to change an aspect/s of their behaviour that will have a positive effect on the environment. A few examples of penguin promises are – recycling/reusing/reducing, saving water and electricity, planting an organic vegetable garden, using eco-friendly cleaners, refusing drinking straws and the single use plastic shopping bag. It has been shown that many people making a small lifestyle change can make an enormous difference! The time for talking is over, it is only action that will make the difference now.. Eager animal keepers from various animal facilities around the country as well as general members of the public take part in the Waddle which spans six days. A distance of 120km is covered on the roads between Gansbaai – where Dyer island breeding colony exists; through Betty’s Bay – Stony Point colony; ending in Simonstown – Boulders Beach colony. The response we received from media last year was most impressive. Word of this endeavor clearly travelled far and wide and each day we experienced a handful of local newspapers, radio stations and television groups making a fine effort to cover our journey and the important reasons for it. The public were equally supportive and showed their excitement in each centre through which we waddled as we held our impossible-to-miss bright yellow hoot for penguins signs aloft in order to attract maximum attention. We counted 682 cars hooting for us during our 11km stretch through Strand and this year we aim to log the number of acknowledgements in every coastal zone in the hopes of perhaps creating a little bit of a friendly competitiveness between zones which in turn will draw more awareness to why we are doing what we are doing! The importance of achieving as many hoots as possible is that this reflects ‘action learning’ meaning that the hootee is bound to remember our campaign more so than the motorist who simply drives on by without participating.. Many learners were brought out from the classrooms by their teachers in order to waddle alongside us for short stretches. It was so inspiring to see the youth embrace our mission and demonstrate this by either dressing in black and white, creating art depicting their affection for the African penguin, or raising small meaningful collections of money which of course we acknowledged and passed on to SANCCOB (The Southern African Foundation for the Conservation of Coastal Birds) for important rehabilitation work. We also impressed upon each learner the need for them to consider and commit to a personal penguin promise of their own. 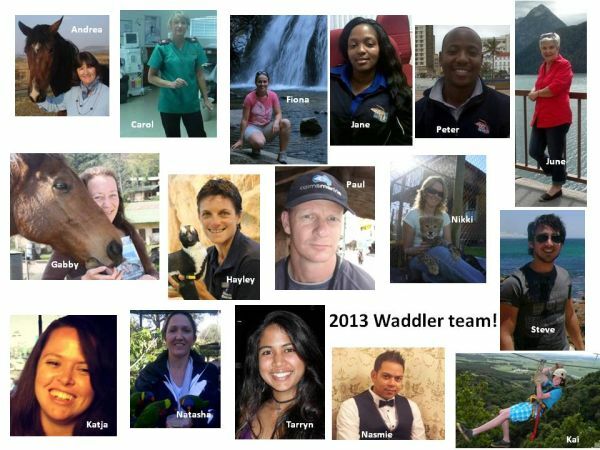 It is possible for anyone to follow or be a part of the waddle – for real or in virtual space. IT following will be by following us on twitter @penguinpromises or our facebook page – Penguin promises. Thursday 25th April: depart from the Arabella hotel at 08h00 – arriving in Betty’s Bay at the main garage on the main road at around 14h30. They gather here and together they all head to the Stony Point Colony. Saturday 27th April: 09h00 – leaving Muizenberg at Surfer’s Corner. Walk the whole way with us or from Simon’s Town at around 12h00. Arriving at Boulders at 13h00. 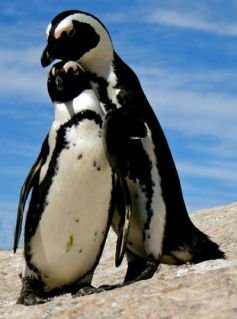 This entry was posted in Cause and tagged African penguin, Penguin promises, Penguin waddle for a week, waddle for a week. Bookmark the permalink.